Authorities have confirmed that a 44-year-old Eagle River man whose body was found Wednesday in a wooded area near the end of Hiland Road was killed by a bear. Alaska Department of Fish and Game spokesman Ken Marsh said the Anchorage Police Department notified him of the finding by the state medical examiner's office on Friday morning. "The cause of death has been confirmed by a bear," Marsh said. Officials have not located the animal responsible for killing Mike Soltis, who was last heard from at around 5 p.m. Monday. Soltis was reported missing Tuesday evening, and his body was found Wednesday morning after a bear mauled a searcher in the woods near where where the remains were found. Marsh said biologists were still trying to trap the bear Friday. He said a brown bear was seen on a game camera overnight Thursday, but as of around 3 p.m. Friday the animal was still on the loose. "We're monitoring the area and we're still going to make an effort to find this bear," he said. Although the medical examiner's finding does clarify things a bit for biologists investigating the incident, Marsh said the exact circumstances of the attack may never be known. Predatory bear attacks are extremely rare, and Marsh said that scenario is a possibility — but so are myriad others, ranging from a chance encounter with a surprised bear to a mother defending its cubs, or something else. Since there were no witnesses to the attack and nearly two days passed between when Soltis went missing and when he was found, Marsh said the exact details will be hard to pin down. "I don't think we're ever going to know exactly what happened," he said. If biologists are able to capture and kill a bear, they'll analyze genetic samples to determine if it was the same animal thought to have killed Soltis. 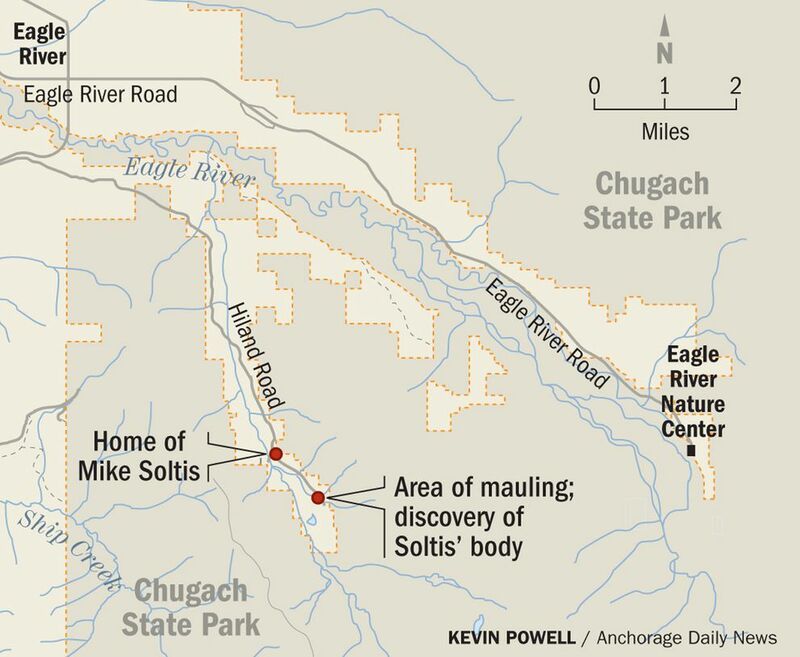 State biologists on Thursday continued trying to locate a brown bear believed to be responsible for the death of a 44-year-old Eagle River hiker and the mauling of a 51-year-old man searching for him. 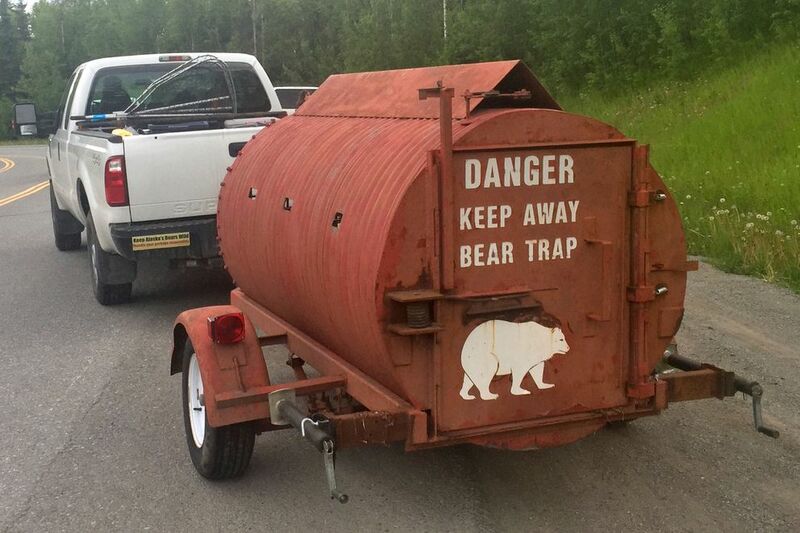 Alaska Department of Fish and Game spokesman Ken Marsh said the department set out bear traps Wednesday night to try to capture the animal, which a witness described as a large brown bear. Biologists were monitoring the traps Thursday. "We haven't located the bear yet. We are still working on it," he said. If it's found, he said, the bear would be killed. "Anytime there's a clear public safety threat, we neutralize the threat by killing the bear," he said. Biologists drove up 9-mile-long Hiland Road on Wednesday night with two baited traps. Marsh said the traps were still there Thursday morning on private land near where the bear was last seen, a brushy, subalpine area high in the South Fork Eagle River Valley, a neighborhood dotted with widely spaced single-family homes. If the traps don't catch the animal, he said, biologists may use other methods such as actively trying to track the bear. "Again, it's developing," he said. "As time goes on, other techniques may be deployed." Marsh said the public will be notified if the bear is located. Biologists have taken DNA samples from the site where the body of neighborhood resident Michael Soltis was found and the attack on volunteer Paul Vasquez took place, which they'll use to make sure any bear that's found is the one involved in the incidents. Vasquez suffered a leg injury when he stepped in front of volunteer Wendi Yohman as the bear closed in on a narrow trail off Hiland Road. Yohman said Wednesday she was the first of three searchers checking the trail when a bear attacked. She said Vasquez was mauled before the trio was able to scare it off. Vasquez was rushed from the scene by a passing motorist and is expected to recover. Marsh said officials "have no indication" either Soltis or the three searchers were carrying firearms or bear spray. Investigators were still trying to piece together what happened to Soltis, an avid hiker who was last heard from Monday evening. He was reported missing shortly after 8 p.m. Tuesday after family and friends determined he'd likely left his home in the South Fork Valley for a pre-dinner hike. Marsh said a final determination about how specifically Soltis died was still being made by the State Medical Examiner Office. Once a cause and time of death are determined, Marsh said, the Department of Fish and Game will be able to better understand what happened. Family and friends of the missing man searched overnight Tuesday and into Wednesday morning, when they expressed frustration about the slow pace of the response by state and local officials. But authorities said Thursday a coordinated ground search was in the process of being mobilized even as the attack on the volunteer took place. "Wednesday morning we were working through the phone tree to mobilize the search teams on the ground to help assist," said Jonathon Taylor, communications director for the Department of Public Safety. Taylor said an Alaska State Troopers helicopter was deployed at around 8:35 a.m. Wednesday, about eight hours after the Anchorage Police Department requested assistance with the search. He said that was the soonest a helicopter could be deployed because pilots had already used up available flight time while working on another search-and-rescue Tuesday night on the Matanuska River. He said officials were working Wednesday morning to get searchers to the area but had to ensure any organized effort was done in a safe manner. "As soon as it was daylight, as soon as people were available, we were calling and trying to get people out there as quickly as possible and as safely as possible," Taylor said. Anchorage police spokesman MJ Thim said officers arrived on the scene at around 9:30 p.m. Tuesday and had a K9 unit at the scene by 3 a.m. Wednesday. Thim said police did not leave the scene until Soltis' body was removed Wednesday afternoon. 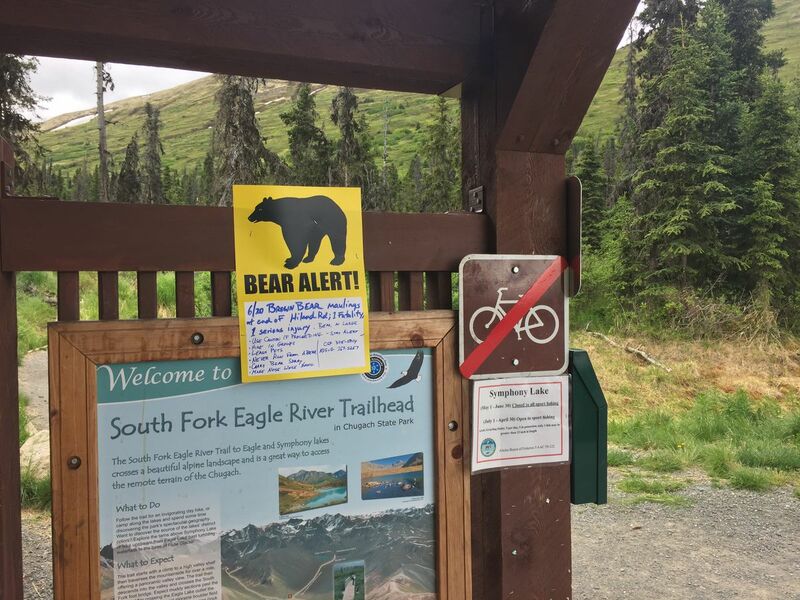 As for preventing future attacks, Marsh said it would be wise for people to avoid any trails in the South Fork area for the next few days or until biologists locate the bear. On Wednesday morning, the parking lot at the South Fork Trailhead — just across the valley from where Soltis' body was found — had seven vehicles. There were no signs warning hikers about bears. Marsh said anyone hiking anywhere in Alaska should practice good bear awareness skills, including hiking in groups, carrying a deterrent of some kind and making lots of noise. "A bear attack can happen anywhere at any time," he said. "Avoidance is the best medicine." Correction: An earlier version of this story incorrectly reported the time that a troopers helicopter was deployed Wednesday. This story has also been updated to correct the spelling of Jonathon Taylor's name.